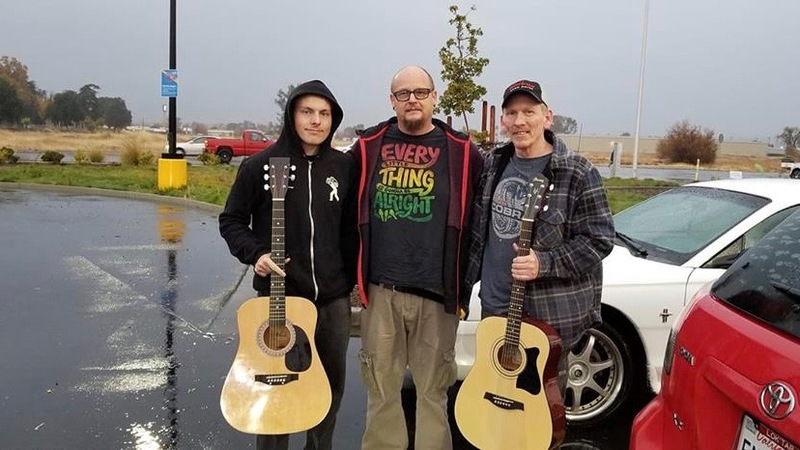 Danny Stipe, Sr. Operations Analyst for Comcast West Division, recently used his superpower of music to give back to the Butte county fire victims and his story is truly inspiring! Not only did he volunteer at a recent Comcast Holiday Party in Chico, supporting over 800 people in Butte County but he had his own amazing efforts on the side. Danny started the Camp Fire Guitar Project to help get instruments into the hands of those who lost theirs in the fire. He organized the program to bring music back to musicians displaced by the Camp Fire and to leverage the artistic community’s powers of healing to rebuild Paradise by hand delivering music instruments. The recipient of the guitar, Rick poses with the duo, The Taylor Chicks, who donated a rare white electric guitar to the Camp Fire Guitar Project. It was Rick’s 70th birthday and he and his band (including his wife) had lost all of their instruments in the fire. He also planned, managed and performed at a local benefit which raised $1600! “Raindance for Paradise” featured live, original music from local favorites, raffle prizes and delicious food. There was even a craft area for kids to make cards for victims and fire fighters. Danny explained that they wanted to maximize the money they raised in conjunction with their volunteer efforts. One of those efforts was for a family friend who lost her home to the fire and prior to that, her husband passed away. She was devastated that his ashes, contained in a wooden box, might end up in a landfill somewhere, and scared her surviving items might be destroyed by cleanup crews (she is an artist, and many sculptures/ceramics survived). So they purchased fencing for her, went to her property and helped salvage and protect those items. They also gave her a wheelbarrow, some tools, and a Lowes gift card. Although they were not able to find her husband’s ashes initially, on her next trip, she was able to locate the metal tag that was in the box with a metal detector, and since the ground was undisturbed she could see the outline of the box and was able to collect at least SOME of his ashes. See more. One of the musicians connected to the Camp Fire Guitar Project was able to perform on stage at the Golden One Center in Sacramento, opening for Common, the X Ambassadors and Pitbull at Gavin Newsom’s benefit to help firefighters! He played his song “Another Prayer for Paradise”, and his partner Nate Smith played his song for Paradise, “One of These Days”. Skip’s song was turned into an absolutely moving video shot in Paradise.